I can't believe it's warm enough for bare legs and shoulders even in the evening! Hurray! Well, now I actually realize that my legs are super white, cause who has tanned legs in May, right? Not that I get tanned really, I actually love my pale complexion and don't spend too much time in the sun during the summer either. The thing is, I found this supper cute red dress with these beautiful ruffles and bare shoulders and I wouldn't have imagined I would get to wear it so soon. It's the perfect summer dress, super chic and easy to style. I figured I could wear it to an open air party, to the beach or even out while running errands. It can easily be dressed up or down and I cannot wait to see how it looks with sneakers and a cute little backpack. I used to love wearing red when I was a blonde, but I am beginning to appreciate this color even more with my natural hair color. It's a great contrast. So for this look I decided to go all in. 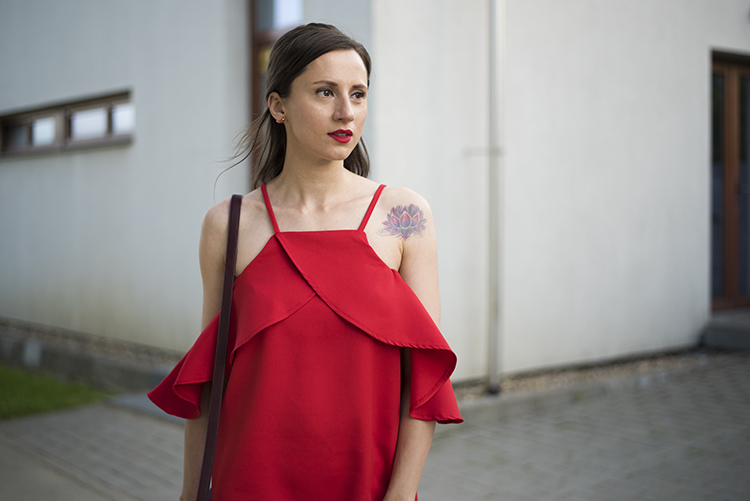 I put on the brightest shade of red lipstick, red and gold sandals and red earrings. I don't have a red bag but this is where I draw the line, it would have been too much red anyway.